How cool is this?! YouTube has jumped on the Bon Iver bandwagon upon the release of his just-release suite of music videos that accompany each song on his self-titled release. We know by now that locals Dan Huiting, Isaac Gale, David Jensen, and JoLynn Garnes worked on those videos, but YouTube has taken it a step further and featured videos from the directors featured on that album. 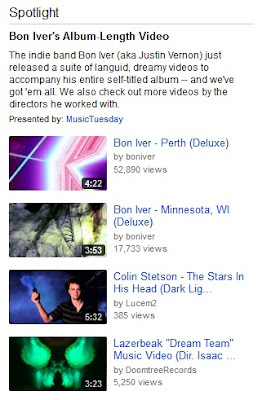 That means videos from the directors' archives including Doomtree, Lazerbeak, Astronautalis, GAYNGS, Heiruspecs, and MN Original, featured on YouTube's main page today. Head over there now to watch the videos. And in other Bon Iver news, his video album has snagged some high-profile press on Time.com and the Fader. Minnesota boys, you done good.